HARD SPUN (USA) (Bay 2004-Stud 2008). 7 wins-3 at 2, Saratoga King's Bishop S., Gr.1. Sire of 689 rnrs, 455 wnrs, 48 SW, inc. Questing (Saratoga Coaching Club American Oaks, Gr.1), Hard Not to Like, Ertijaal, Wicked Strong, Hard Aces, Le Romain, Smooth Roller, Hardest Core, Zo Impressive, Big John B, Moviesta, Promising Run, Tarquin, San Nicasio, Red Duke, Text'n Hurley, Island Town, Maftool, Reload, Power Trip, Khusoosy, Hard Enough, etc. TESBURY JACK (g. by Armidale). 7 wins to 1200m, A$535,350, MRC Caulfield Sprint H., Gr.2, VRC Moomba P., L, MRC Kevin Heffernan S., L, 1200m-in track record time, Sir John Monash S., L, BSB Packaging P., Jayco H., NP Distribution H., 2d SAJC Goodwood H., Gr.1, 3d MVRC Jayco H., 4th MRC Heath S., L.
Charlottes Mint (f. by Planchet). 7 wins to 1300m, A$145,829, MRC Cove Hotel H., Ladies in Racing Magazine H., MVRC Fisher & Paykel H., 2d MVRC City Jeep I Brought a Jeep H., MRC Event Landscaping Solutions H.
Regal Reward (f. by Regal Shot). 5 wins to 1300m in Aust. Bless My Soul (g. by Don't Say Halo). 5 wins from 1200m to 1750m in Aust. Laundered (g. by Hard Spun). 3 wins. See below. Clear Strategy (g. by Strategic). 2 wins at 1200m, 1350m in Aust. Monego (g. by Prego). Winner at 1200m in Aust. Jeff's Joy (f. by Strategic). Placed at 2 & 3 in Aust. Light the Fuse. 2 wins at 1100m, 1200m, VATC With Me H., 2d VATC Allan Wicks H.
Vital Cash. 2 wins at 1100m, 1500m, SAJC Johnnie Walker Striding Man S.
Clear Money. 2 wins. See above. Safe Addition. 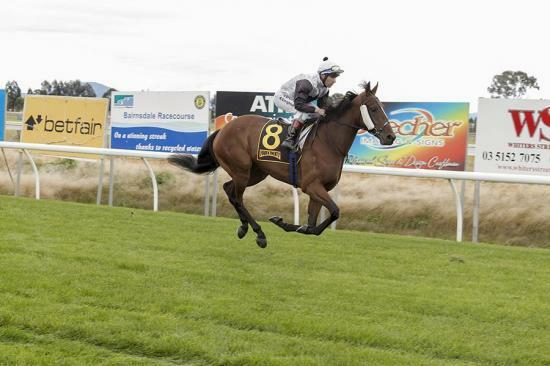 2 wins at 1200m, 1600m, 3d TRC North Forest Products H.
Easy Plan. 8 wins from 1300m to 2050m, A$89,225 in Aust. Neon Leon. 2 wins at 1400m, 1600m in Aust. Innocent by Birth. 2 wins at 1600m, 1650m, BTC Aspley Leagues Fuji Xerox P., 2d BTC Cleanevent P., 3d QTC Rough Habit Bar P.
Western Showdown (Western Symphony). 5 wins from 1900m to 2800m, A$108,350, STC Rotaract Welter H., AJC Captain Cook H., STC Gymea Probus Club H.-twice, 2d AJC 2YO H., NSW Tatt's RC 3YO H., STC Yootha H., 3d AJC St Leger, Gr.2, 4th STC Parramatta Cup, L.
Always a Rush. Winner at 2, WATC Minchinbury Champagne H. Producer. Sequoia Inn. 3 wins-1 at 2-to 1400m, VRC Scobie H., 2d VRC Exford H.
Midday Affair. 3 wins to 1350m, BATC Novice H.
All Whiskey (Fimiston). 2 wins at 1200m, 1600m, WATC Cottesloe H., Win with Westspeed H., 2d WATC Champion Fillies S., Gr.3, Daffodil H., International Room H., Powered By Fruit N Veg H., Burswood Dome H., Mercato H.
Mikaldico (Fimiston). 5 wins from 1300m to 2100m, A$327,110, WATC Pure Blonde H., Bullfrog International H., Singing the Blues H., Westspeed Stayers' Bonus H., 2d WATC Ascot Gold Cup, L, Rogan Josh H., 3d WATC Ascot Gold Cup, L, Tattersall's Cup, L.
A Bonny Drop (Ron Bon). 3 wins at 1000m, 1600m, A$81,874, WATC Gay Epic H., Whelarra H., Mini Top H., 2d WATC Lady Belvedere H., West Coast Eagles Welter H., Forehand H., 3d WATC Jungle Dawn Classic, L, Pink Healthcare Trophy H. Producer. Grey Label (Light Spirits). 9 wins-1 at 2-from 1200m to 1600m, NZ$106,505, Hawke's Bay Horizon Homes Sprint H., Waikato RC Peugeot New Zealand H., WRC GP Print Whyte H., Industrial Distributors H., Rangitikei Gold Cup, WRC Hutt Valley Cartage S.H., 3d Wellington Guineas, Gr.2, WRC Whyte H., L, 4th Wanganui JC Trust Bank Central S., Gr.2. Race Record: 9 Starts 3-0-1 A$40,450. 3 wins from 1400m to 1800m to 2015-16 in Aust.